Get out of town with these interesting Cruz Bay side-trips: Virgin Islands National Park (Annaberg Sugar Plantation, Leinster Bay, & more). Spend the 21st (Thu) among aquatic life with a scuba or snorkeling tour. The adventure continues: enjoy the sand and surf at Trunk Bay, tour the pleasant surroundings at Cinnamon Bay Beach, explore and take pictures at Cinnamon Bay Nature Trail, and contemplate the waterfront views at Maho Bay. To see other places to visit, ratings, maps, and tourist information, read Cruz Bay online trip planner . Houston, USA to Cruz Bay is an approximately 10-hour combination of flight and ferry. The time zone difference moving from Central Standard Time to Atlantic Standard Time is 2 hours. Traveling from Houston in February, expect nights in Cruz Bay to be much hotter, around 73°F, while days are somewhat warmer, around 84°F. Finish your sightseeing early on the 23rd (Sat) so you can travel to Charlotte Amalie. Charlotte Amalie is known for shopping, wildlife, historic sites, nightlife, and spas. Your plan includes some of its best attractions: enjoy the sand and surf at Magens Bay, tour the pleasant surroundings at Lindqvist Beach, take some stellar pictures from Mountain Top, and meet the residents at Coral World Ocean Park. To see ratings, reviews, and tourist information, use the Charlotte Amalie online trip itinerary maker . Traveling by combination of ferry and car from Cruz Bay to Charlotte Amalie takes an hour. Alternatively, you can ride a ferry. 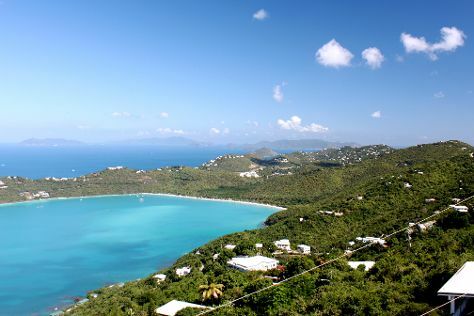 In February, daytime highs in Charlotte Amalie are 84°F, while nighttime lows are 73°F. Finish your sightseeing early on the 26th (Tue) to allow enough time to travel back home.